Christmas comes only once a year, lasts 24 hours, and then goes away. So why all this fuss about Christmas come the holiday season? One has to admit that all the fun actually comes from getting ready for THE day. Indeed, since our earliest memories, we were taught that being well behaved would result in us getting presents from Santa Clause (or Father Christmas), which, to an extent, must have been imprinted in our minds ever since, giving us a reason every year even as we grow up to get excited for the holidays, that Christmas spirit. Even if you don’t get that Christmas spirit, other people will make sure you do, from those around you to the high street businesses. And rest assured that the weather won’t forget to remind you of it either… Therefore, as winter’s arrival can be quite brutal, we thought we would make it less painful for everyone by giving you this list of things to do to embrace the holiday season. 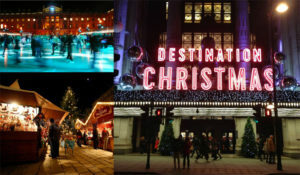 Ice skating: the arrival of winter sees the return of ice rinks throughout London, enjoy ice skating before it’s too late, below are a few places to get your skates on. Winter Wonderland 2013: get in the Holiday spirit right in the center of London at Hyde Park for rides, attractions, food at the Christmas market and also the ice rink. The Enchanted Woodland 2013: take a night stroll in Syon Park’s Gardens and Arboretum where the park’s trees will come alive thanks to exciting lighting effects. Christmas windows: from Selfridges to Harrods, there are plenty of beautiful window displays to inspire you this season! Christmas markets: find the most original gifts this holiday season in the city’s numerous markets dedicated to the holiday season.